Last week I gave a little Powerpoint presentation to the Weymouth Lure Fishing Forum. The participants had just spent the weekend fishing the Purbeck coast for bass but the conditions were horrendous with unusually rough seas and lots of dirty water. In view of the problems it was hardly surprising that the number of bass caught was small but, as a sort of second prize, some of the anglers had managed to catch decent numbers of good wrasse up to about six pounds. After I’d spoken we all had a natter about the whys and wherefores of fishing and one of the topics that came up concerned the tackle required for catching wrasse, in the rocky, weedy territory that they choose to inhabit. Now I’ve been catching lots of big wrasse on plugs for many years and at first they were generally landed on the standard eight pound BS nylon. Clearly, had I tried bait fishing with similar line, the result would have been the loss of much tackle and many good fish. Wrasse are, of course, noted for bolting into caves and under ledges as soon as they feel the hook so most traditional (sensible) float or paternoster tackle involves at least twenty or twenty-five pound lines and fairly beefy rods. Recently there has been a trend towards the use of softbaits for these fish, I’ve had quite a few myself and some of the other specialist wrasse seekers have caught many more. Just as in my plug fishing of years gone by, the tackle tends to be suited to bass spinning rather than tug-of-war. How is this possible? For some reason the fish rarely (I can’t say never) go to ground after they are hooked on the lighter tackle and they often put up a fair old battle. 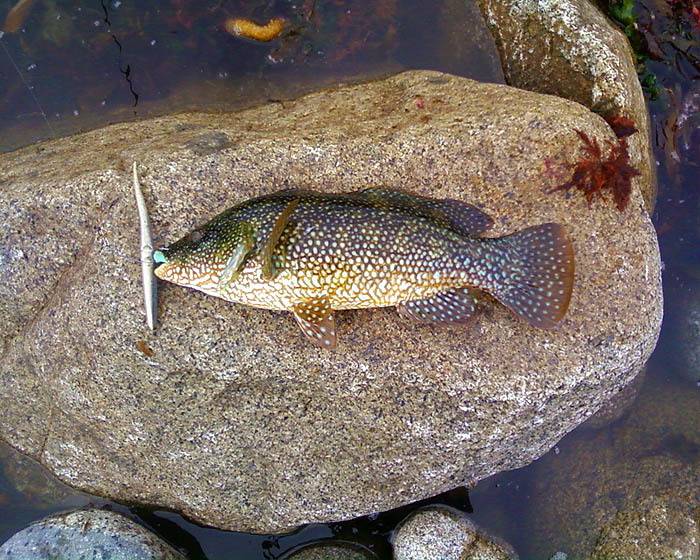 My plug fishing technique usually involved a steady retrieve and, often, wrasse could be felt tweaking at the tail of the lure as it was wound in. I’d assumed that, because the fish were clearly swimming along after the lures, that by the time they were hooked they were often well away from their known hidey holes. Similarly, it seemed possible that, because the lures were already on the move when they were actually taken, the fish were sort of ‘caught off balance’ and unable to dive for cover. When using softbaits, although the gear is similar to plugging tackle, the situation is quite different. The lures are generally lowered, more or less under the rod tip, and jiggled about among the kelp fronds and rocky, underwater terrain. It seems that the hooked wrasse (which are many) are just as easy to land as when plugging, so another explanation is needed. I suppose that, because the line is kept more or less tight there is instant contact and so the fish are often hooked as soon as they take the lure. This fits in with the ‘off balance’ hypothesis much better than the ‘far from home’ idea. Perhaps there is some altogether different explanation which, as yet, we have not realised but one thing is sure – it’s good fun catching wrasse and it expands your fishing possibilities into the sunny afternoons of summer when other species may be a bit thin on the ground. I returned to 'Weedy Bay' which produced that fine fish the other day but on this occasion there were no bass in and around the weed. I did however catch four wrasse. I've attached a photo of one of them. They were all caught on weightless, weedless, Slug-Gos, fished ultra slowly with hardly any movement, just the odd twitch here and there. When I realised I wasn't going to have any luck catching a bass with this method I changed tactics to a surface lure, a chartreuse Patchinko. I've never had much luck with surface lures before but I'm aware of their potential. Anyway, to cut a long story short, I managed a cheeky little bass of maybe a pound (if that!) on it. It's always good to catch fish, even the little ones. We currently have a large swell and strong winds like everyone else, so it makes things a bit more challenging. I'll let you know if I have any more success with this method.